By the way, if this makes you eager to try einkorn, be sure to grab my free recipe for the every day no-knead bread we love and that my husband declares is “the best bread I've ever eaten!”. When you’re buying einkorn, you’re likely supporting a small farm or farmer who is more interested in a healthful food than production standards. Einkorn is harder to farm, harder to mill (it’s hulled), and it costs more to ship (less dense). I’m thankful for companies like Einkorn.com and Jovial Foods who are making einkorn mainstream and who are working on viable shipping and supply options so we can use it! When we used whole wheat and I made something for guests, the hearty taste was often off-putting. It was heavy and it had the “healthy” taste. Now using einkorn, our baked goods have a slightly nutty taste, but nothing heavy or anything that screams health food. Everyone comments they really like it! I’m using sifted einkorn flour. I either use berries from Einkorn.com that I sift, or I buy pre-sifted einkorn flour through Jovial Foods. This is so lovely. Our sourdough english muffins, pizza crust, cakes… everything turns out so light and fluffy. Sifted einkorn is a lot like the lightness of whole grain spelt flour. It doesn’t behave the same (einkorn is sticky where spelt is gloppy) but the end result is really, really nice. Our grilled pizza crust is especially amazing! Wardee: Hey everyone! Welcome. This is kind of a follow-up episode to last week's episode on Einkorn 101, with my special guest Jade Koyle of einkorn.com. Well, I just love einkorn and we talked so much about einkorn and how special it is and the great things Jade is doing, and then I figured, I'm going to take one more week and I'm going to make a special announcement, but I'm also going to tell you why I heart einkorn. I have four reasons. So, that's coming up. First, though, let's do the tip of the week. It's about einkorn; wanted it to be very relevant. Years. I just started feeding it einkorn flour. I don't even think it went through a transition period. It just took to it right away, so now it's an einkorn flour sourdough starter. Now, einkorn does not absorb as much water as other grains, but spelt doesn't absorb as much water either, so going from spelt to einkorn is probably not as big as a difference as going from, like, wheat or rye, to einkorn, so just be prepared that you're going to use more flour and less water to keep that thick consistency of a starter. So, that's your tip of the week. If you're interested in einkorn sourdough baking, go ahead and switch your starter over. If you're nervous at all, split your starter in half and get some of it going on einkorn and keep feeding the other half the way you have been, and then you can decide later what you want to go with. That's the tip of the week. Okay, so, now… Four reasons I heart einkorn. So, here are some nutrition benefits of einkorn. Wheat gluten studies have found that einkorn wheat may be non-toxic to sufferers of gluten intolerance. This isn't a guarantee, it's a possibility. It's a very interesting one, isn't it? I just want to say, if I say einkorn wheat when I'm quoting Jade's article, it's because einkorn is an ancient variety of wheat. It's the first wheat we know of. Einkorn wheat has fourteen chromosomes, while modern wheat has forty-two. This could be friendly to the body's digestive system. Einkorn contains three to four times more beta-carotene than modern wheat, and the great thing about this is that the beta-carotene is a boost for immunity. It helps prevent cancer and heart disease. Einkorn contains two times more vitamin A – vitamin A is a retinol equivalent – than modern wheats, so this is good for healthy eyes, reproductive organisms, and prevention of many cancers. Einkorn contains three to four times more lutein than modern wheats. The benefit of this is the prevention is macro-degeneration and cataracts. Einkorn contains four to five times more riboflavin than modern wheats. This is used by the body to create energy, and is an antioxidant that slows aging. And finally, einkorn is a hulled wheat, meaning it has a hull on it. Now, this makes it more difficult to go from grain to table, because the hull needs to be removed, but modern wheats do not have a hull and the hull during the growing can actually protect the grain from stray chemical contamination and also from insects and pests, so it's an easier grain to grow organically. That's a great nutritional benefit, that, you know, translates right to our health. So if it's easier to grow organically, it's more readily available organically. And so, we get organic einkorn out of that. 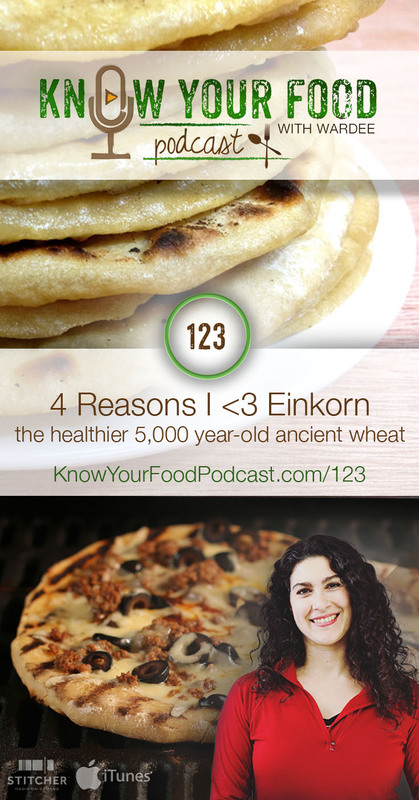 So, that's a summary of all the health benefits of einkorn that come from einkorn.com. I wanted to tell you my personal story, because I and my family certainly have a positive health experience with einkorn. As I've talked about many times, I guess it was about three years ago that my family started the GAPS diet, and we did it for a few months. And my main reason was because I had just seriously debilitating seasonal allergies, and my allergies went away within days, and they have not come back. I've been seasonal allergy free ever since. So, I've gone through three complete allergy seasons without having allergies, and yes, I credit the GAPS diet to that, but I also credit the fact that I did not go back to modern wheat. I use einkorn. I have noticed, like if I've been traveling and I have a sandwich on regular bread, or whole-wheat bread, I'll get a little bit sniffly. But in our home and on the daily basis, we do sourdough einkorn, and there is no recurrence of seasonal allergies for me. There is one member of my family, we're consistently working on gut health, and where regular breads, regular whole-bread wheat bread, causes digestive issues, einkorn does not. So, we're sold on it. And we've made a commitment to eat ancient grains, and we love einkorn. It's been a great experience in our family. 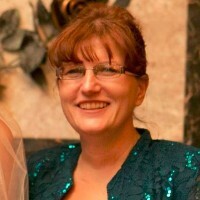 I want to add something that came out of last week's podcast, http://knowyourfoodpodcast.com/122, when Jade from einkorn.com was my guest. He mentioned that einkorn has half the phytic acid as modern wheat. This is amazing for all of us. It has significance, because we are all traditional food lovers, and one of the cornerstones of traditional food prep is to soak, sprout, or ferment seeds. Grains are a seed, and the preparation of soaking, sprouting, or souring/fermenting, reduces phytic acid, in that seed. Now, phytic acid if it's not reduced, and we just eat it, it binds with minerals in our digestive system and actually blocks mineral absorbtion. So, we don't want to have any more phytic acid than we need to, because we don't want mineral deficiencies. Well, right out the gate, einkorn has half as much phytic acid as modern wheat. So, if you're going to, you know, not soak, sprout, or ferment, and you know, whip up some muffins or pancakes or cookies with einkorn flour, you're already half ahead of the game than if you did it with wheat. You know, that's probably an okay compromise occasionally to do that. If you have mineral deficiencies, you wouldn't want to do it on a regular basis, but isn't it nice to know that you could feel better about doing that with einkorn, than with modern wheat? And then if you do take the time to add soaking, sprouting, or fermenting, to your grain prep method — whatever you're making, muffins, cookies, pancakes, english muffins, bread, cakes — you know, if you're doing that with your einkorn, you're getting the best of both worlds. So you're starting out with half as much phytic acid. The overall reduction is going to be even greater than it would be with modern wheat, because soaking doesn't reduce all the phytic acid. Souring is the best, but souring needs to be warm and for a long enough period of time to reduce it 100%. So, the very fact that you're starting your recipe with less than with modern wheat means that your traditional methods you're using are more effective, so it's fantastic. That was just reason number one! I'm going to go on to number two now. Reason number two: einkorn is an artisan product. I don't know if you feel the same way as I do, but I love supporting small farms, small artists. I just think it's just a beautiful thing that people are doing to share their craft with the world, and this is the way I feel about einkorn. When we're buying einkorn flour, or einkorn grain, we're likely supporting a small farm or farmer who is more interested in a healthful food than production standards. And that's not to say people shouldn't be after efficiencies, or running their businesses in the black, but big businesses sacrifice health and quality for the sake of a profit, a lot of the times. And I just don't feel the same way about small farms and small farmers, artisan producers, artisan food producers. They, like us, are interested in health, and I think a lot of them are willing to make less money so that they can deliver us a quality product. So that's what you're supporting when you buy einkorn flour. Einkorn grain, einkorn flour; it's harder to farm, because the plants are smaller, there's less yield per plant. It's harder to mill. As I mentioned earlier, it has that hull, and that hull protects it from stray chemicals and pests, but it means it has one of the biggest challenges there is with grain, which is efficiently de-hulling the grain so that we can use it. So, that just adds an expense to the whole process of bringing it to us. It's less dense, so it costs more to ship. A bushel of wheat has a lot more grain than a bushel of einkorn, so it takes up more space. This is what you're supporting. Something which is a little harder to get to you, but somebody is really dedicated to getting it to you because it's worth it and it's healthful, and you can feel good about supporting something like that. Personally, I'm thankful for companies like einkorn.com and Jovial Foods. They're making einkorn mainstream, they're working on viable shipping and supply options to bring the cost down so that we can use it. So we need to keep supporting them, because they do have our best interests at heart. And so when you're buying in now, when you're supporting it now, you're supporting this longer effort to make more of it available at a lower cost. Reason number three is the taste. I love the taste of einkorn. It's not bland, like white flour. It's also not as strong as wheat. I remember when I first got into whole grain baking, and so it was just so exciting to make homemade whole-wheat bread, or homemade whole-wheat tortillas. They had a really strong flavor, and we loved it. We grew to love it, we transitioned so we hardly noticed it anymore. But when we had company over, and we would have taco night or something with homemade tortillas – of course I was very proud of my homemade tortillas, or if the girl's had made them, they were very proud of making them for our guests – there's a big different between those and white flour tortillas. I really don't think our guests enjoyed them much actually. They noticed the flavor, they noticed the color. They were thicker and harder. I mean, honestly, I make a really good whole-wheat tortilla, but it's not going to be like a white-flour tortilla. No matter, you know, they were soft, and pliable, chewy… The taste, though, was strong. So, the taste is really wonderful. And I have reason number four now. The result. Which is kind of what I was talking about in number three, but a little bit different. So, the results that we're having with einkorn flour in our house are just amazing. We do sourdough pizza with einkorn, we do it in the winter, we do it inside, but just recently with outdoor summer cooking, we've been doing grilled pizza. The crust is amazing. We've been doing sourdough english muffins with einkorn for months, and they're wonderful. Now a big difference is what I'm doing with the grains. So if I've got einkorn grain and I'm milling it myself, I'm sifting it. Or I'm using Jovial Foods All-Purpose einkorn flour, which is sifted. And so because that coarser, denser stuff is removed, you know, the germ and the bran, if you're getting it from Jovial Foods, it's a more shelf-stable product because the parts that can go rancid are removed. If you're milling it yourself, sifting it just gives you this lighter, fluffier flour. So I'm just loving it, it's so lovely to make english muffins, or pizza crust, or cakes, or cookies. They all just turn out so light and fluffy. I don't know if you've baked with spelt before, but before we baked with einkorn, I baked almost exclusively with spelt. That's why, like, all the recipes in the Sourdough eCourse at traditionalcookingschool.com or our Sourdough A to Z eBook; all of my recipes I contributed were spelt-based, and I gave substitution instructions for whole-wheat, but I basically developed the recipes on spelt. I used spelt for a long, long time, and I think that einkorn flour when you mill it and then you sift it, it's like whole-grain spelt flour in its lightness, fluffiness, and taste. I really loved using spelt, I felt that spelt flour was comparable to whole-wheat pastry flour in its lightness, and I'm feeling the same way about sifted einkorn flour. Now, it doesn't behave the same as spelt. Spelt — I mentioned this in last week's podcast, 122 — spelt, the word I would use to characterize it is ‘gloppy,' and when you're making batters or doughs with einkorn, it's more like ‘sticky.' But the end result is very similar and really nice. Our grilled pizza is especially amazing. I'll have the link to our sourdough english muffin recipe, and our sourdough pizza crust. You just simply use einkorn flour in them. Those recipes are so flexible to getting the right consistency that I just use as much flour as necessary to get the right consistency. I think overall you're going to be using less liquid, so you could reduce the liquid, or you could adjust the other ingredients up, to get the right consistency. And as I gave you the tip of the week at the beginning of this episode, if you want to use those recipes with einkorn, you could go ahead and get your starter switched over now to einkorn flour, or just use your starter. Whatever you're feeding it now, you could still use it in an einkorn recipe. If you're leery at all, split your starter in half and get half of it going on einkorn. See how it does! Start experimenting. I think you will really, really enjoy the results. Okay, so those were the four reasons I heart einkorn. Number two, it's an artisan product we love to support. And number four, the results. I have a special announcement now. We've been on a break at Traditional Cooking School from classes; we wrapped up Cooking Outside early in the year, and now it's time to start a new class. It's very appropriate that I'm telling you about it now with this episode. In fact, maybe I decided to do this episode so I could make the announcement relevant, or maybe….? Anyway. It's that age old question: which came first, the chicken or the egg? Well, these two go hand-in-hand. Yes, I heart einkorn, and I'm also thrilled to tell you what our new class is. You can probably guess. It's Baking With Einkorn. Einkorn baking. And the second part to that is our oldest daughter is now graduated from high school and she's going to be working with me closely, on this class. So, she has become the queen of desserts and she primarily uses einkorn, so she's going to be teaching you a whole bunch of einkorn desserts and I'm going to cover the breads and the savory dishes. There may be some overlap there. If you've got any questions or feedback or thoughts about einkorn yourself. Thanks, God bless you, and I'll see you again here soon. Free recipe for “No-Knead Artisan Sourdough Einkorn Bread” — our favorite daily bread! I would love to hear from you! Do you have questions or comments about anything shared in this episode? Like this podcast? Please help me reach others by using the share buttons at the top of this post. Thanks! What sifter do you use to get the finer flour? Erin — I’m old school at the moment and just use a fine sieve. Totally by hand. It works for now! I have a smaller one that’s more suited for smaller amounts of sugar. This looks great. I made my sourdough starter from Einkorn flour and it was perfect. Made the best loaf of bread last weekend, using the starter and Einkorn flour. Served the bread with my fave summer salad Black-eyed Pea Salad made with red and yellow peppers, red onion, minced garlic, cherry tomatoes, olive oil, lemon juice, salt and pepper. Mary – Wow, that sounds amazing. Thanks for sharing! Great podcast! I’ve enjoyed using Einkorn, but am still trying to get used to it. I bought a L’EQUIP sifter that sits on my Bosch that I’ve been using for sifting. I’d be delighted to know what you are using to sift your Einkorn. The L’ EQUIP sifter sifts so finely, it makes pastry flour. I am sooooo excited about the upcoming class on Einkorn!!! What an answer to prayer! Bless you! Michelle — I’m using a fine sieve right now, though I’m sort of looking for another option. Thanks for recommending what you’re using! I’ll see you in the class — it’s going to be great. I went to the sourdough english muffin and pizza crust posts, but didn’t see any updates/changes when using Einkorn flour. I don’t want to have any “mess-ups” since the flour is more expensive. Wardee, can you comment on what changes you made when using Einkorn? And which kind of Einkorn flour did you use…Jovial bought flour, freshly ground, or freshly ground then sifted? I too am so excited about the upcoming class. Einkorn is a flour that is my final destination, but because of it’s special uniqueness, haven’t delved into it. Ok, so I use either Jovial all-purpose, or fresh ground sifted. In the case of either, I use around 3 cups. It’s pretty loose because I’m after the same kind of texture as Erin. Einkorn doesn’t change it that much, but it is a bit more stick initially. However, it absorbs water as it sours. I do very little handling of the dough. I don’t knead. Just mix to wet all the dough, then sour. After the souring and then adding the leavening, I let it rise for about 5 minutes in the bowl and then I take big spoonfuls and transfer to the cast iron skillet (pre-heated for cooking). I shape them out a bit with the back of the spoon and my fingers. Most of the time I will weigh them right on the spoon before putting in the pan and I aim for about 100g to 110g each (so they end up uniform size, but this is optional!). I tare the scale for the weight of the spoon beforehand so all I’m weighing is the dough. I cover the pan so they will bake as well as cook on the side touching the direct heat. They turn out beautifully!!! Oh! My previous reply was about the English Muffins. I just switched my starter over to Einkorn and just used freshly ground flour….I didn’t see the need to waste any! I also did what Wardee mentioned of pulling a little bit of starter out before I did the switch, just in case. Mine did just fine, wasn’t very bubbly for a day or so, but I think it was mainly a learning curve figuring out how much flour/water it liked. My previous starter was Rye and it liked it on the runny side. Einkorn does better with a thicker batter. The plus side to pulling some off beforehand is if you are continuing to bake, you won’t have to wait to build it up the Einkorn starter. I’ve made pizza crust and English muffins with my Einkorn starter and Einkorn flour. Love it! Can’t wait for the class! Hurry up September!! If I sift my flour, I am losing the benefit of the germ and the roughage, correct? Isn’t there a benefit to not sifting or am I stuck back in old nutritional information? I am all for making my baking more tasty and light, I just don’t want to sacrifice good nutrients. I’m wondering the same thing, Kathie. I always hear about white flour turning into paste in your intestines. I did make the English muffins with the whole wheat einkorn and they turned out great! Wardee wasn’t kidding about the stickiness! It will take some getting used to. I’m assuming that I will usually use the fresh ground without sifting but would like to know how the sifted is for nutrition. Flours are actually less nutritious when you leave the outer parts. The entire outer coating of the grain is considered an “anti-nutrient” as it uses more of your body’s resources to digest it than what the food actually provides and returns to your body. When Wardee talks about phytates, or phytic acid being an “anit-nutrient” this is what she’s talking about. It’s the plant’s own natural pesticide. If you want to understand this subject, you can look up “Pellagra” or “Beriberi”, which are both the result of vitamin deficiencies caused by consumption of unsoaked or untreated grains. While both are rare in the US due to vitamin fortification, there still exists some concern that anti-nutrients from unsoaked grains cause issues with intestinal permeability and auto-immunity. Read Nourishing Traditions, by Sally Fallon Morell if you want to learn about the reasons for soaking, souring, and sprouting grains for better nutrient absorption. We finally tried some Einkorn spaghetti noodles (from Thrive Market) and even my husband said it had more flavor than regular whole wheat products ! And it’s healthier for you !! Now I need to find some flour or Einkorn wheat to grind and try my own recipes !! Thanks for all your great information !! What about a person whose diabetic… do you know if it raises the blood sugar.? While it’s a gentler grain, it is still a carbohydrate so may raise blood sugar. You’d want to consult with your doctor or a dietitian for their recommendation.